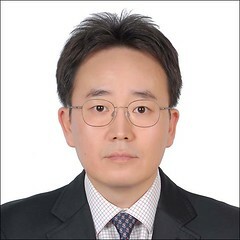 Post written by Tae Hoon Lee, MD, PhD, and Jong Jin Hyun, MD, PhD, from the SoonChunHyang University School of Medicine and Korea University College of Medicine. In technical aspects of endoscopic papillectomy, whether submucosal injection papillectomy should be performed is still debatable. Injecting saline solution or a diluted epinephrine solution into the submucosal layer of the gastrointestinal tract to lift tumorous lesions is frequently performed during EMR or ESD. However, whether these solutions should also be used to lift ampullary tumors during endoscopic snare papillectomy has not been established. Therefore, we investigated the clinical efficacy of a simple snaring method (SSP) versus submucosal injection (SIP) for papillectomy, especially given achieving complete resection and preventing post-papillectomy adverse events. This study was important because the first prospective comparative study was performed to investigate the efficacy of submucosal injection for endoscopic papillectomy. This study will also provide a guide or framework for the technique of endoscopic papillectomy. 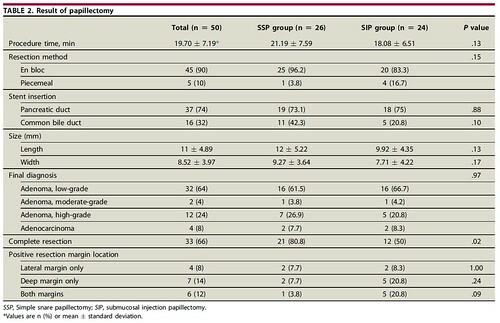 We found that SIP had no advantage over SSP in terms of achieving complete resection or decreasing the frequency of post-papillectomy adverse events, such as bleeding. Complete resection rates in the SSP and SIP groups were 80.8% (21/26) and 50.0% (12/24), respectively (P = .02). However, tumor persistence at 1 month (15.4% vs 8.3%, P = .62) and recurrence at 12 months (12.0% vs 9.5%, P = .58) did not differ despite initial differences in the prevalence of a positive resection margin. Post-papillectomy bleeding developed in 42.3% (11/26) and 45.8% (11/24) of patients, respectively (P = .80). Delayed bleeding (>12 h) occurred in 27.3% (3/11) and 36.4% (4/11) of patients, respectively (P = .50). Post-procedure pancreatitis occurred in 15.4% (4/26) and 25% (6/24) of patients, respectively (P = .49).